Model Nazi tells the story of Arthur Greiser, the man who initiated the Final Solution in Nazi-occupied Poland. Between 1939 and 1945, Greiser was the territorial leader of the Warthegau, an area of western Poland annexed to Nazi Germany. In an effort to make the Warthegau 'German,' Greiser introduced numerous cruel policies. He spearheaded an influx of hundreds of thousands of ethnic Germans. He segregated Germans from Poles, and introduced wide-ranging discriminatory measures against the Polish population. He refashioned the urban and natural landscape to make it 'German.' And even more chillingly, the first and longest standing ghetto, the largest forced labour program, and the first mass gassings of Jews in Nazi-occupied Europe were all initiated under Greiser's jurisdiction. Who was the man behind these dreadful policies? 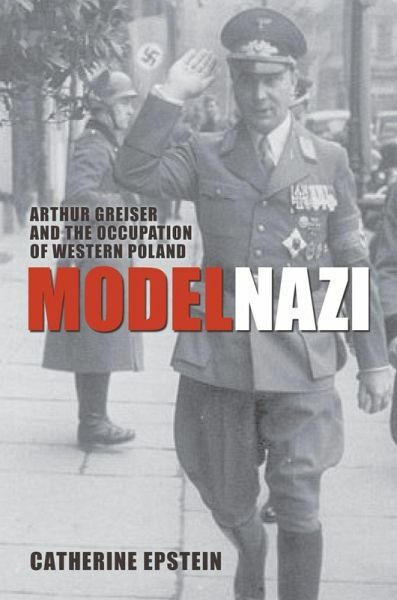 Catherine Epstein gives us a compelling biographical portrait of Greiser the man: his birth in the German-Polish borderlands, his rise to Nazi prominence in Danzig, his actions as party leader in the Warthegau, and his trial and execution in postwar Poland. Drawing on a remarkable array of German and Polish sources, she shows how nationalist obsessions, political jealousies, and personal insecurities shaped the policies of a man who held remarkable power in his Nazi fiefdom. Throughout, Epstein confronts a burning question of our age: why do individuals imagine genocide and ethnic cleansing to be solutions to political problems? Catherine Epstein teaches modern European history at Amherst College. She is the author of The Last Revolutionaries: German Communists and Their Century (2003) and A Past Renewed: German-Speaking Refugee Historians in the United States After 1933 (1993), and she also serves as Associate Editor of the journal Central European History.